As with most of the west, irrigation has played an important role in Montana agriculture since nearly the beginning. The earliest irrigation systems in the state were small and straightforward affairs built by local farmers ... but that all changed in the early 20th Century, when a new federal agency called the United States Reclamation Service began developing irrigation projects all over the West. Many of the new federal projects were large and technically complex, and they transformed the business of farming in the areas they served. The Reclamation Service built a number of irrigation systems in Montana over the years. One of the first was the Huntley Project, just east of Billings along the Yellowstone River. Work on the project started in 1906 and the first water flowed two years later ... and the system is still going strong today, irrigating some 30,000 acres of farmland. There are lots of pictures of the Huntley Project being built, and technically this isn't a very good one ... but I thought the subject matter was pretty cool. 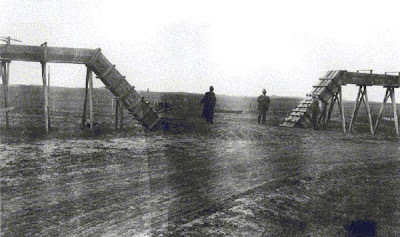 The shot dates from 1907, and shows a newly-finished water flume a few miles northeast of Billings. The thing was built with a siphon in the middle, to allow a farm road to pass above. I wonder if he has any knowledge or information about the project up in Babb. The majority of the Hi-line owes its likely-hood to that diversion. The city of Havre wouldn’t exist without it. It was built right around the same time. Yep, I've actually poked around there a fair amount ... I've even been *inside* the water discharge structure at Sherburne Dam, which is the upstream water source for the project.